Welcome to the newly decorated and furnished Disney 5 Star. Nestled within a quiet family friendly neighborhood. Why stay in a cramped hotel room when you can enjoy the benefits of a whole house? 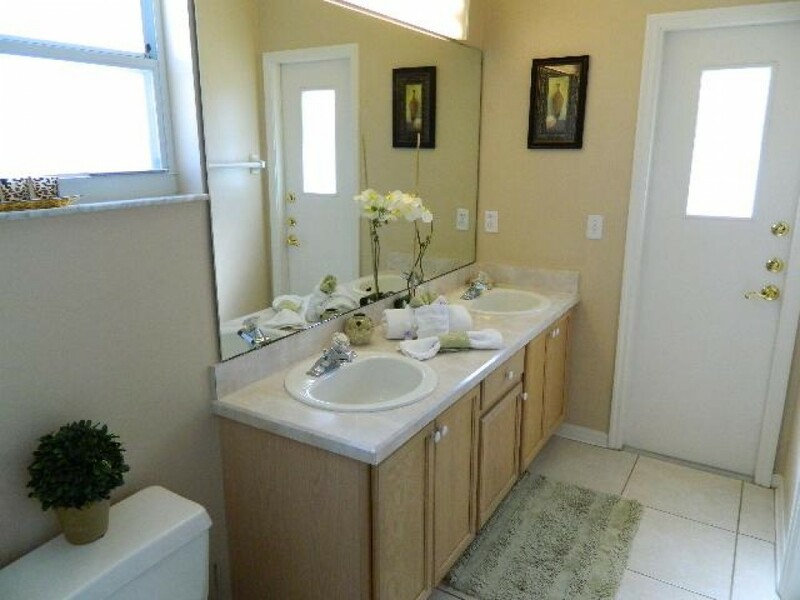 This 4 bedroom/2 bath well appointed home comfortably hosts eight to ten guests. Upon your arrival, you are welcomed into the spacious great room with vaulted ceiling. The room is furnished with comfortable couches to relax and enjoy over 200 channels on a 42 inch flat panel t.v. or a movie on the dvd player. The open concept floor plan boasts a large dining table which seats eight people and has a wonderful view of your private screened in heated pool. Attached to the kitchen you will find the breakfast bar where you can enjoy those quick snacks throughout the day. For the chef in the family, everything you will need can be found in the kitchen to prepare as much, or as little, as you like, including the telephone to order in. It is complete with all major appliances, including a dishwasher, as well as the little things like microwave, toaster and a blender to prepare that chilled tropical drink. The home comes equipped with a washer and dryer should you want to get a jump start on your vacation laundry. There is plenty of entertainment for the young and old. Enjoy lounging by the screened in pool well into the evening hours while enjoying a snack on the deck. For those with more energy there is a games room with table tennis, foosball and a video games console at your disposal. The master bedroom boasts a king sized bed and 24 inch flat panel t.v. The attached full ensuite facilities, with double sinks and walk in shower, and direct access to the pool for those late night dips. There is a second master with a queen size bed and 24 inch flat panel t.v. The two bedrooms separating the masters each contain 2 twin beds and have a disney theme. One bedroom theme is "Disney Princess" and the other is "Mickey Mouse". Each room has its own 20 inch flat panel t.v. The second bathroom has a large tub for your convenience.